Tatiana Volkova is an art historian and independent curator. She lives and works in Moscow. Volkova has held curatorial positions at the Tsaritsino Museum, State Tretyakov Gallery, Reflex Gallery, the Garage and ZHIR project (Moscow). Since 2009, she has been dedicated to activist art. 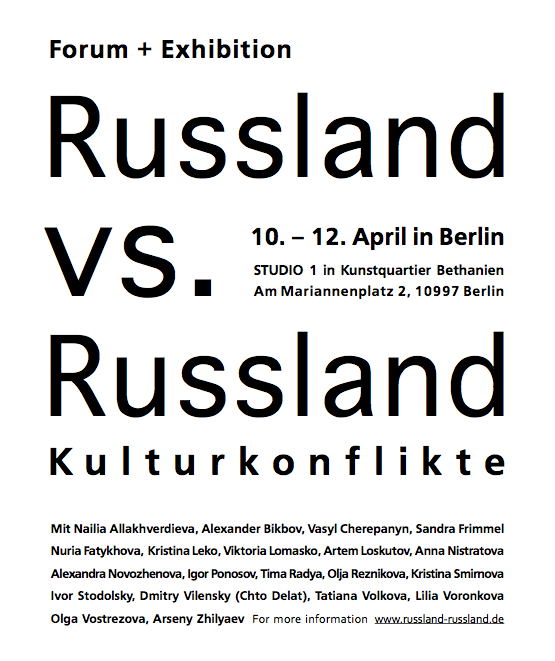 Volkova curated a series of exhibitions of Russian activist artists at the ZHIR project, Moscow (Winzavod Art Centre, 2009-2010); ‘Silence=Death’ exhibition at Artplay Centre (Moscow, 2012), Media Impactors at OKK-Raum-29 (Berlin, 2012); Russian art activists’ show ‘Election festival’ at De Balie (Amsterdam, 2012) and many more. She also co-curated the ‘Art-Abai’ street action together with Denis Mustafin (Moscow 2012). Volkova is an initiator and group member of the MediaImpact Festival of Activist Art. Since 2011, it has been held in Novosibirsk, Murmansk, Nizhniy Novgorod, St. Petersburg, Yekaterinburg, and in Moscow (three times). From 2013 to 2014, she was part of the curatorial team for the ‘Global Activism’ exhibition at ZKM (Karlsruhe, Germany). Since 2014, Volkova has been head of the curatorial program at the Higher School of the Russian State University for the Humanities, Moscow. In this speech I will explore the involvement of contemporary artists in protests in Russia during the past decade and a half. This involvement has altered the role of the artist in contemporary society, leading to the emergence of a burgeoning movement known as activist art. Today art critics are faced with a challenging task: the necessity to articulate and to reflect upon the transformations of the place and function of contemporary artists within rapidly evolving socio-political processes. The ideal of cultural democratization itself is associated with a whole range of participatory art practices that engage the audience in the creation of an art work. Participatory processes refer us to Joseph Beuys and his idea of “social sculpture” as a direct artistic intervention into reality. It is believed that this hybrid of art and political activism originated in America in the mid-1970s. Activist art has been characterized by innovative uses of public space for addressing socially important topics and rousing communities to action. In Russia, the term has been in use since the early 2010s, when it became obvious there had emerged a circle of artists who interacted with the reality around them in a fundamentally different way. Now the changing functions of today’s artist-activist should be analysed: precursor and catalyst of social processes, spokesperson for public sentiment, participant in mass protests and solidarity actions with victims of repression, defender of the rights of minority and socially excluded groups.